Super Crispy Baked Parmesan Chicken Tenders breaded in Italian breadcrumbs and Parmesan cheese. A quick and easy 30 minute weeknight meal everyone will love! I like my chicken extra extra crispy. Most of the time that requires deep frying them in oil. While fried chicken tenders are good they aren’t exactly great to eat ALL the time. I decided to make my favorite chicken tenders in the oven instead of deep fried in oil. The outside of the chicken tenders are crunchy and golden brown. The inside is juicy and tender. 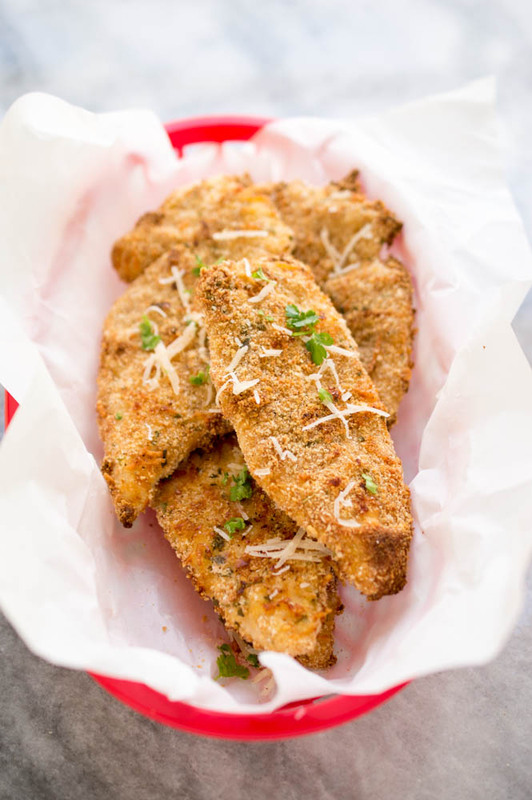 These Crispy Parmesan chicken tenders taste just like fried chicken without all of the calories! At first glance it’s hard to tell these chicken tenders are baked and not fried. They are a quick and easy weeknight meal. Great for kids and adults alike. Who said healthy food can’t taste good?? 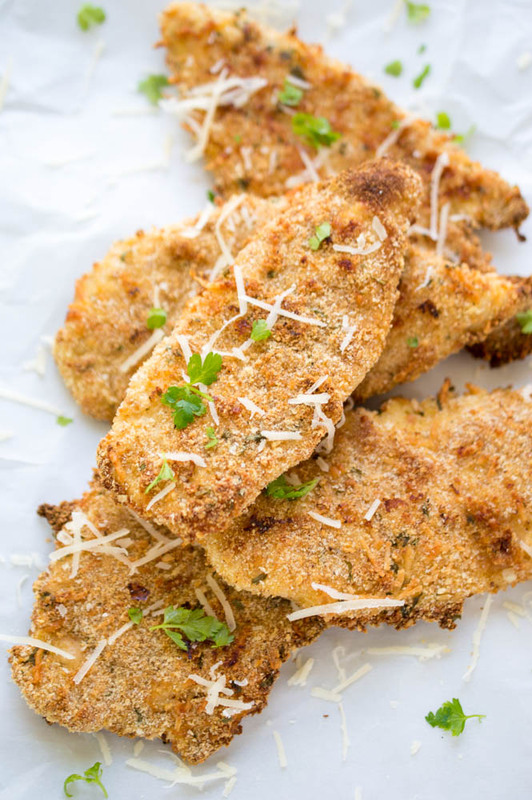 These Crispy Baked Parmesan Chicken Tenders are perfect for a quick weeknight meal or as a snack / appetizer for game day. I added an extra sprinkle of Parmesan cheese and fresh parsley on top of the chicken after it gets out of the oven. I love to serve this chicken alongside marinara sauce or ranch dressing. 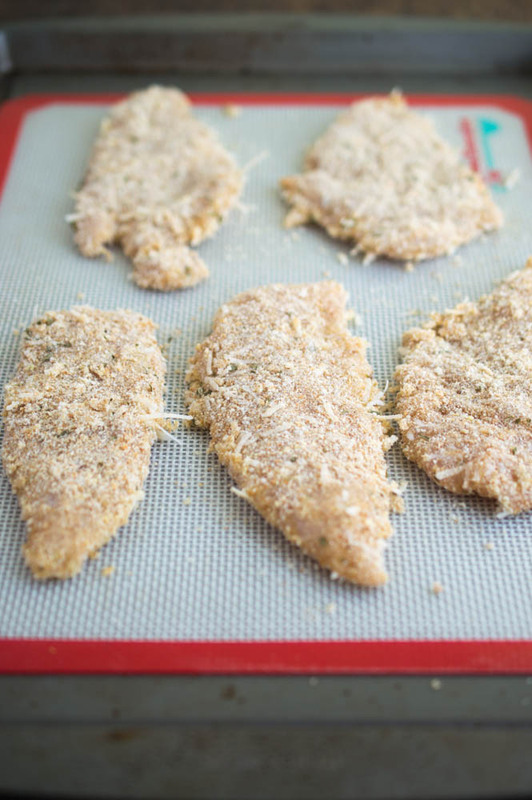 The secret to these chicken tenders is the Parmesan cheese mixed in with the breadcrumbs. The cheese gets crispy and caramelized in the oven. These chicken tenders are super easy to make. They take less than 30 minutes start to finish. To make the chicken tenders we start with a simple 3 step breading procedure. Flour, egg and our Parmesan + breadcrumbs. Once breaded I place the chicken on a baking sheet with a silicon baking mat and place in the oven for 15-20 minutes. When it’s done I take them out of the oven and sprinkle with extra cheese and chopped parsley. Serve with some of your favorite dipping sauces and enjoy. You can easily make your own Italian breadcrumbs at home if you prefer. Just pulse together stale bread (or plain breadcrumbs) garlic powder, onion powder, oregano, dried parsley, salt and pepper. 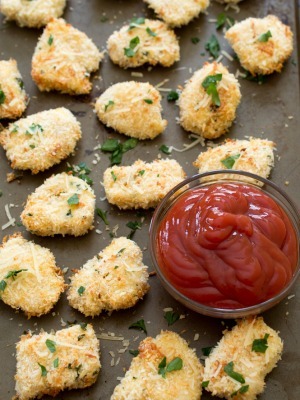 Love these Crispy Baked Parmesan Chicken Tenders? Here are some more delicious chicken recipes! 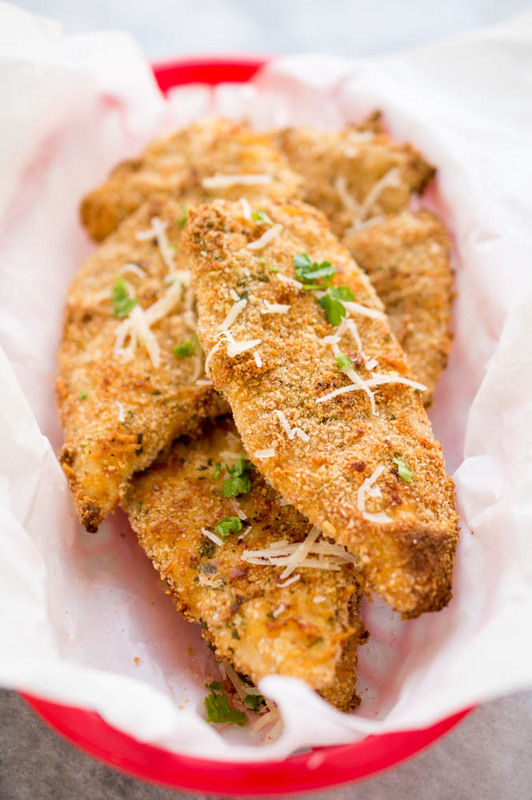 Super Crispy Baked Parmesan Chicken Tenders breaded in Italian breadcrumbs and Parmesan cheese. A quick 30 minute weeknight meal everyone will love! Place in the oven and bake for 15-20 minutes until fully cooked. 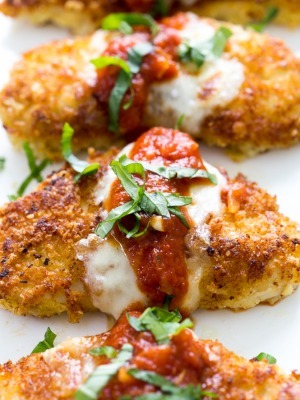 Serve with a side of marinara sauce or ranch dressing! I’ve been craving chicken tenders lately! These look lovely Kelley! Wonderful flavors! Can’t wait to try them! Oh my gosh! Give me some of these with those sweet potato fries you just made! Perfection 🙂 Pinned! These look great! I love my chicken tenders super crispy too, but it IS hard to get them that way in the oven, and I definitely prefer to not deep fry my chicken for a meal at home! So much healthier to bake it. These actually look really crispy so I will definitely be trying this recipe! Pinned! I love chicken tenders.. especially ones that are as golden and crisp as these! Totally craving a couple of these to devour right now – just need to get my hands on some chicken so I can make the recipe! Haha! That happens to me all the time. Hope you enjoy! These chicken tenders look delicious! Love the fact they’re baked, but are still super crispy and delicious! And that parmesan coating sounds amazing! Love this! I’m a super fan of chicken, and tenders is an amazing way to go! I actually made these last night with a touch of hot sauce, sooooo good! Glad you like them! I like hot sauce on my chicken tenders as well! EVERYONE WAS TIRED OF THE SAME THING FOR DINNER SO i GOT THIS AND WE ARE TRYING IT TONIGHT. WILL LET YOU KNOW. Great hope you enjoy Linda! I’ve made chicken tenders before and they were kinda bland but these were absolutely wonderful!! I love this recipe! Definitely will use again. Thank you Sarah! I am so glad you liked it! if you dont have the silicon baking mat, can you use a metal rack ? or what would you suggest as a substitute? I would suggest using parchment paper. A metal rack on top of a baking sheet would work as well. what kind of parmesan do you use grated (powdery kind) or shredded?? Either kind would work. I’ve used both before. These chicken tenders are awesome!